Tuberculosis is a scary word. It brings up thoughts of wards in ancient hospitals with the populous locked off from the rest of the world. It’s a disease that can cause misery due to coughing up blood. But is that what tuberculosis is? Is tuberculosis contagious? In this article, we’ll walk you through everything you’ve ever needed to know about tuberculosis. From what causes tuberculosis, to tuberculosis diagnosis and the treatment of tuberculosis, this guide will go through everything you need to know about tuberculosis. We will dispel many of the inaccuracies that many people just take as fact. This is your complete guide to everything TB. What is tuberculosis (TB)? Tuberculosis is an infectious disease that is caused by a bacteria called mycobacterium tuberculosis. While it mainly infects the lungs, tuberculosis can affect other parts of the body. Most tuberculosis infections don’t have symptoms (referred to as latent tuberculosis). Tuberculosis gained the alternative name of “consumption” due to the amount of weight loss that its sufferers would usually have. Is tuberculosis contagious? It’s probably the main question and main point of concern when the topic of tuberculosis is brought up. Unfortunately, tuberculosis is not only contagious, it’s very contagious. Tuberculosis can be transmitted through the air by coughing, sneezing, spitting, and other airborne transmission methods. Unfortunately, some carriers of TB will not have any symptoms, and will then unwittingly transmit the disease to others who will end up getting a full blown attack. In fact, dead bodies with tuberculosis can still be contagious. Anyone with TB should be careful around someone who doesn’t have it, and take precautions so they don’t spread the disease further. That being said, while tuberculosis is highly contagious, it is also hard to catch. So, someone who has tuberculosis can be coughing in the face of one person for hours, and that person will never catch it. Meanwhile, the next person may get it via one simple cough. Tuberculosis is caused by a bacteria called mycobacterium tuberculosis. Mycobacterium tuberculosis is a bacteria that mainly affects the respiratory system (lungs). It can only be spread by air droplets from speaking, coughing, sneezing, and singing—as opposed to shaking hands or other plain physical contact. Humans are the only mammals that can contain a reservoir of mycobacterium tuberculosis, and according to scientists, the bacteria has only been present in humans for around 5,000 years. The key to fighting tuberculosis is catching it early and dealing with it as soon as possible. To that end, it’s important to recognize the early symptoms of tuberculosis. In normal cases of tuberculosis affecting the lungs, symptoms can include coughing. You should be concerned if you’re coughing and it brings up thick, cloudy, and sometimes bloody mucus from the lungs. If this continues for two weeks or more, see your doctor. It should be noted that tuberculosis may affect other systems beyond the respiratory system. TB can cause joint and spinal pain. The liver and kidneys can also be affected, which can lead to blood in the urine. You think you may have early symptoms of tuberculosis and you’ve gone to the doctor. How is TB diagnosed? Is it a series of painful tests? Is it a simple mouth swab? Here’s what to expect. The first step will be for the doctors to listen to your lungs and check for swelling in the lymph nodes. The doctor may follow that up with a number of questions about your medical history, as well as where you’ve recently been. If everything is sounding like TB to the doctor, they will probably proceed with a skin test. The doctor will inject an injection of PPD tuberculin, which is made with the bacteria that makes up tuberculosis. After a few minutes, if a hard bump appears, TB is more than likely in your system, and further tests like x-rays will be scheduled. If you are the unfortunate person who has contracted tuberculosis, don’t panic. This isn’t the 1800s and there are actually treatments available for those who infected. For the most part, patients with tuberculosis are given a treatment regimen of antibiotics. But unlike other times you’ve probably been on antibiotics for another type of infection, the treatment regimen for tuberculosis can last for a few months (anywhere between six to nine months depending on how well the treatment appears to be working). These treatments usually use multiple drugs as TB has some strains that have become antibiotic-resistant. This tends to be the case for TB patients who also have HIV, and are on treatments for that disease. Those infected with latent tuberculosis have a bit of an easier time as they will usually only have to take one drug. Despite these side effects, the drug treatment must be fully completed, as any left over bacteria may become resistant to the drugs if you stop the treatment prematurely. Multi-drug resistant TB or MDR-TB has become a bigger problem in the past decade. Along with the complications that come from the drug treatments, tuberculosis can come with a great number of complications that don’t involve the lungs. These tend to be the typical side effects of tuberculosis. Another complication of TB can be the swelling of the membranes that cover your brain, otherwise known as meningitis. Tuberculosis and the treatments for TB can affect both the liver and the kidney’s abilities to get rid of waste. Tuberculosis joint pain and damage usually occurs in the hips and knees. While it is rare, tuberculosis can infect the tissues that surround your heart. This can cause fluid build up and inflammation that can interfere with your heart’s ability to pump effectively. The answer is a little bit of yes and no. In North America, TB has luckily become a rare thing. There is a vaccine for TB, but it’s rarely used in North America as it doesn’t work well in adults. The best course of action is essential, stay away from tuberculosis. If you know someone who has it, avoid them until their drug treatment is complete, or at the very least, don’t be in closed, small, stuffy rooms with them. Wear a face mask around someone with TB. Follow these pieces of advice and there’s a good chance you will be fine. Tuberculosis is rare in North America and there are treatments available if you do somehow contract it. But make no mistake, TB is a very serious problem in other parts of the world and just because you have less likely a chance of getting it here, it doesn’t mean you might not pick it up elsewhere. If you do get TB, take it seriously and follow your doctor’s orders to the letter. “Tuberculosis,” eMedicine Health, June 24, 2016; http://www.emedicinehealth.com/tuberculosis/article_em.htm. Davis, C. P., “Is Tuberculosis (TB) Contagious?” Medicine Net, August 16, 2016; http://www.medicinenet.com/is_tuberculosis_tb_contagious/article.htm. 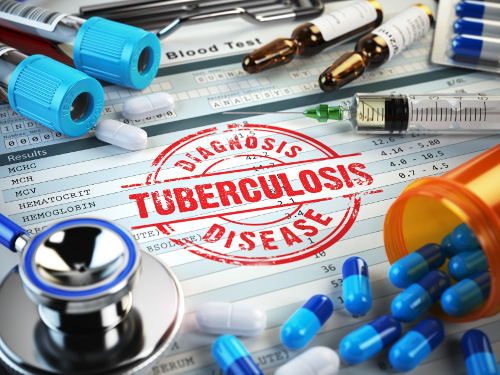 McIntosh, J., “Tuberculosis: Causes, Symptoms, and Treatments,” Medical News Today, January 18, 2017; http://www.medicalnewstoday.com/articles/8856.php#tuberculosis_causes.